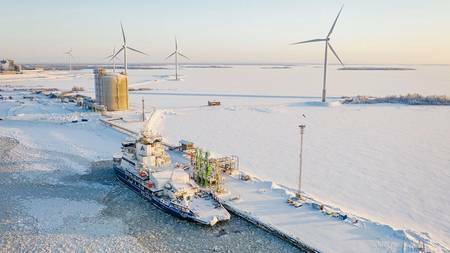 World’s first liquefied natural gas (LNG) icebreaker Polaris refueled for the first time at the Nordic countries’ largest LNG terminal in Tornio in the icy Röyttä Harbour. As of yet, LNG is the world’s most environmentally friendly ship fuel. It does not contain sulphur, and its combustion generates approximately 87% less nitrogen oxides in comparison to regularly used Marine Diesel Oil (MDO). Furthermore, LNG’s particulate matter emissions are nearly non-existent. “This is the third winter in the demanding, icy conditions of the northern Baltic Sea for the world’s first LNG-powered icebreaker. Polaris has met our expectations with flying colours proving that it is truly a next generation icebreaker,” says Markus Karjalainen, Head of the Winter Navigation Unit of the Finnish Transport Infrastructure Agency (FTIA). FTIA is responsible for Finland’s icebreaking services and for making sure that Finland’s harbours can be accessed throughout the year. The world’s most environmentally friendly diesel–electric icebreaker, Polaris, joined the fleet of the state’s icebreaker shipping company, Arctia Icebreaking Ltd, in September 2016. By being one of the world’s first shipping companies to start using LNG, Arctia promotes the transition towards cleaner fuels in navigation. This development is not only significant for the Finnish maritime cluster but also for national and international climate objectives. “In addition to using LNG, all of Polaris’ operations aim at environmental friendliness. For example, the lubricant used in the ship’s propulsion system is biodegradable. The ship’s grey water, which basically consists of showering water, is collected to a container which is emptied during port calls. In other words, nothing is released to the sea, even if it the water has been purified,” says Pasi Järvelin, Master of Polaris.